Just in case you can't tell, I'm kind of obsessed in love with Echo Park's new Creative Agenda collection. It's fun, it's colorful and works for so many different topics. I've used it on layouts about Disney, Alexa decorating her school locker and now one about Alexa's first day of school. I'd say that's pretty versatile. Did you notice the wise little owls I snuck in? They're Doodlebug Doodle-pops from the Paper Issues store. Aren't they adorable? I thought they went well with the back to school theme. 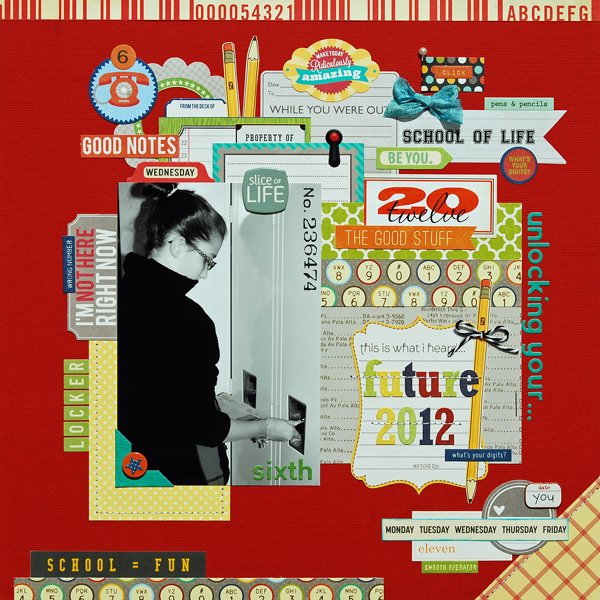 I also used some tags and a chipboard frame from Crate Paper's Notes & Things collection. A new linky party has started at Paper Issues. It's called You're Sew Cute, You Keep Me in Stitches, sponsored by May Arts Ribbon. 1. 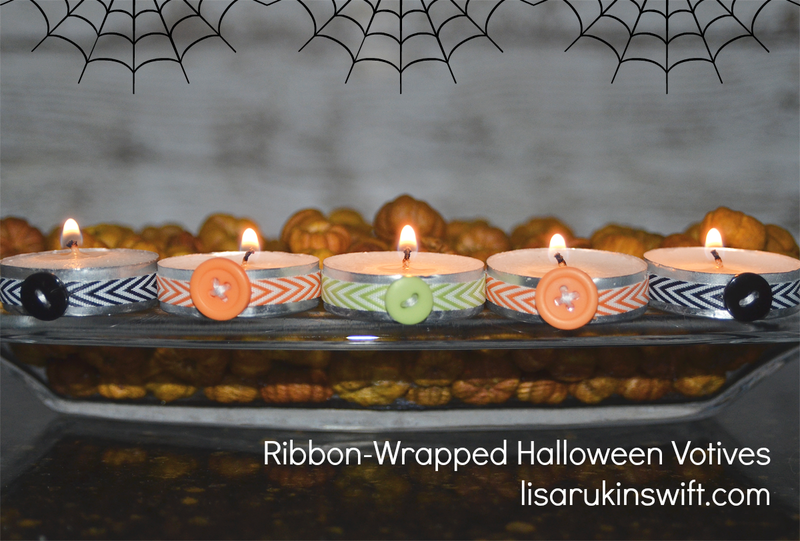 Wrap ribbon around each votive's metal holder. Cut to length. 2. Add adhesive to the back of each ribbon strip (I used my Xyron X). Adhere around the metal holders. 3. Thread buttons with embroidery floss. Add a Glue Dot to the back. Adhere over the ribbon seam. Check out the Paper Issues blog to see some amazing design team ribbon projects and get all of the details about what you could link up for a chance to win four (yes, four!) 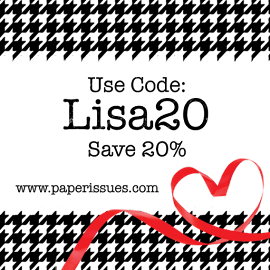 rolls of May Arts ribbon. Some of you may remember Gallop, our Turkey on the Shelf. If not, here's a post about his origins and arrival. This year will mark Gallop's third visit (at Alexa's request). He gets into all sorts of trouble and shenanigans, much like the ever-popular Elf on the Shelf. Since Gallop starts his visit on November 1st and leaves the night before Thanksgiving (because he doesn't want to end up on our dinner table), I end up with many photos of his antics. The first year I assembled all of the photos in a mini album. For last year's photos (above), I used Simple Stories Sweater Weather collection. I plan to use the layout above as a title page, followed by the pocket-style pages I shared with you last month. You'll find more information about this page, along with some detail shots, on the Simple Stories blog. Happy fall! To commemorate the start of the new season, I have a Simple Stories Sweater Weather layout to share with you. Believe it or not, this photo was taken in the spring. I put off scrapping it because the colors said "fall" to me and I didn't have any product on hand that worked well with it. I'm glad I waited, because this collection worked perfectly. For more information about this page, and to see some detail shots, please visit the Simple Stories blog. Turns out the start of school, and this photo op, couldn't have happened at a better time because it coincided with the release of Echo Park's new Creative Agenda collection. 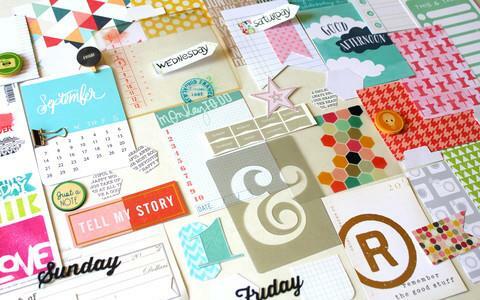 How perfect are all of the art-themed embellishments, references to the days of the week, and other day-to-day elements? I love it all! I'll be back on Monday to share another Creative Agenda layout. In the meantime, enjoy the rest of your week and have a great weekend! Yesterday I shared an altered Whisker Graphics bag designed to store travel photos. 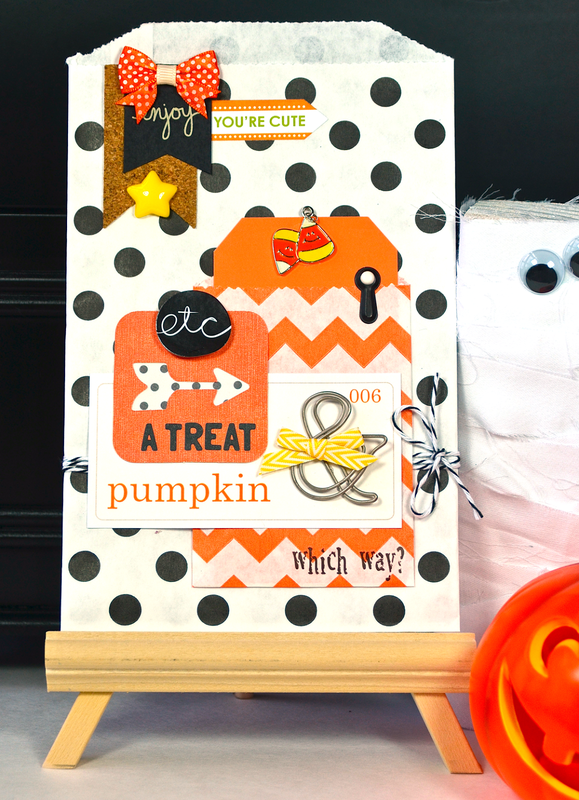 Today I'm sharing a 5" x 8" Halloween treat bag. I topped a larger bag with a bitty bag, tucking an orange shipping tag inside. I also added embellishments from a variety of Paper Issues Swag Bags. How cute will this be stuffed with tasty Halloween treats? I think they'd be a hit at class parties! 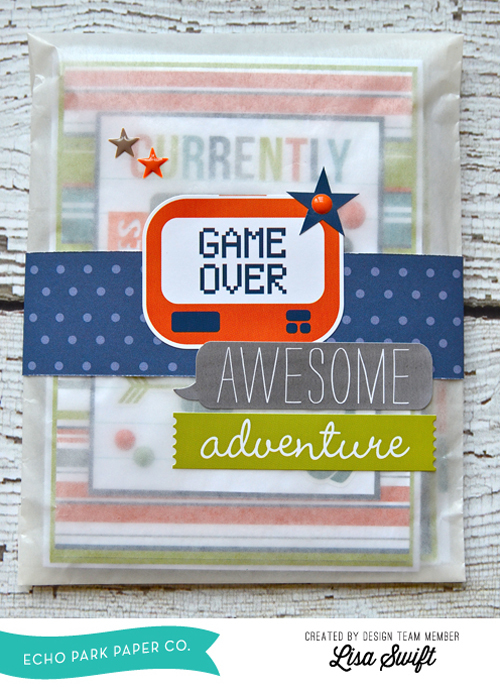 A brand new linky party has started at Paper Issues. It's called Anything Goes, sponsored by the awesome folks at Whisker Graphics. They sent the design team a wonderful mix of their products to create with — Divine Twine, colorful bags (in two sizes), adorable stickers and shipping tags in an assortment of colors. I used a 5" x 8" bag to create a storage spot for travel photos. The finished project could hold photos until you're ready to scrap them or it could be added, as is, to a layout or album. So what topics does the Anything Goes theme cover? Your all-time favorite projects, Whisker Graphics projects and projects with bags, twine, tags or stickers. 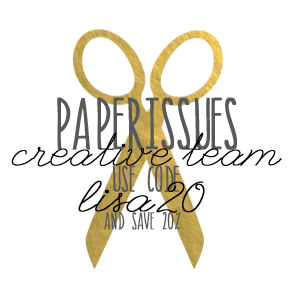 Please visit the Paper Issues blog for all suggested ideas. Hi everyone! Paper Issues has released the September Swag Bag. It looks like a fun one this month — kind of an office/organization/calendar theme going on. That's definitely right up my alley. I can think of so many uses for these elements, especially for those of you who are pocket page scrappers. This embellishment kit is a steal at $9.99 but you can use my code LISA20 to get it for 20% off. Eight dollars for a cutie pie glassine bag full of fun embellishments and 3x4 cards is a great deal in my book. 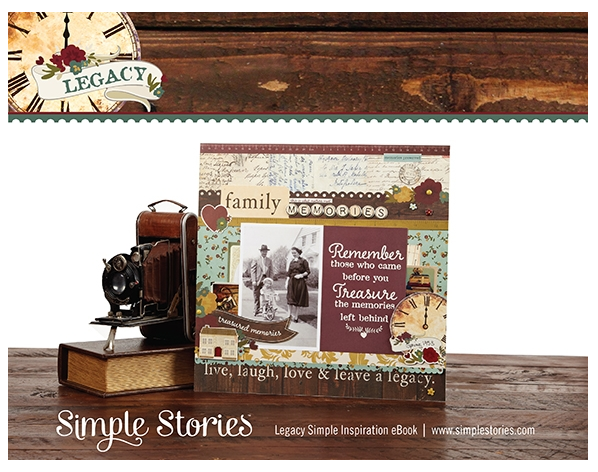 Simple Stories released a new eBook featuring projects created with their beautiful new Legacy collection, perfect for all of your family and heritage photos. This is a free download (PDF) so be sure to check it out. Here's a look at the collection kit. I created this card with the goodness contained in the August Swag Bag from Paper Issues, along with items from my stash. What's a Swag Bag you ask? 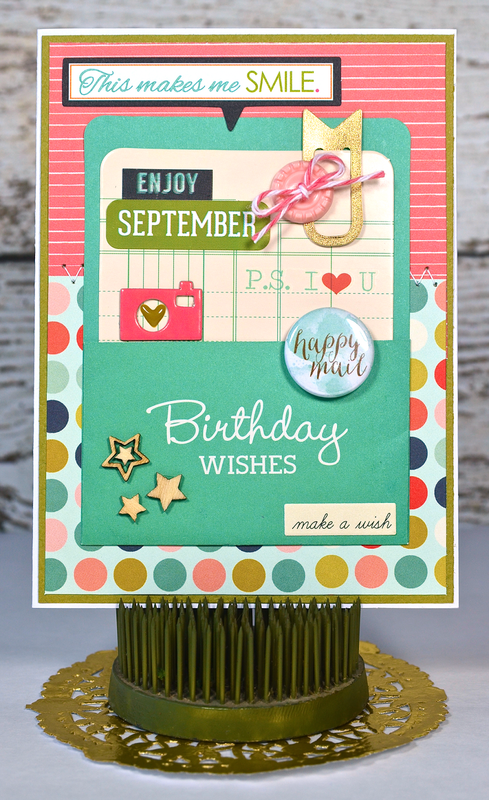 It's a monthly kit filled with an amazing assortment of 3x4 cards and embellishments. The 3x4 cards are perfect for pocket pages, layouts and (in this case) card making. I'm going to start stalking my mailbox, because my September Swag Bag should be arriving any day now...There's nothing like peeling back the fresh washi tape seal on that glassine bag of goodies! If you'd like to sign up for a Swag Bag subscription, be sure to visit the Paper Issues store. Use the code LISA20 for 20% off (the code applies to your entire order). 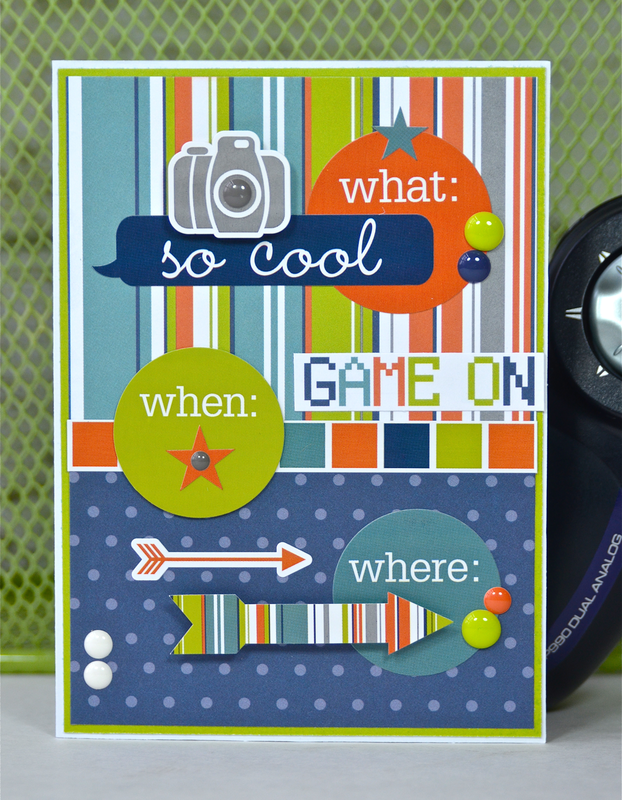 Linking up to Crafty Creations No. 26 at The Memory Nest. On Tuesday I shared a birthday invitation created from Echo Park's Game On Mini Theme. On Wednesday I showed you a card that focused on the gaming side of this collection. Today's card is for the music lover in your life. 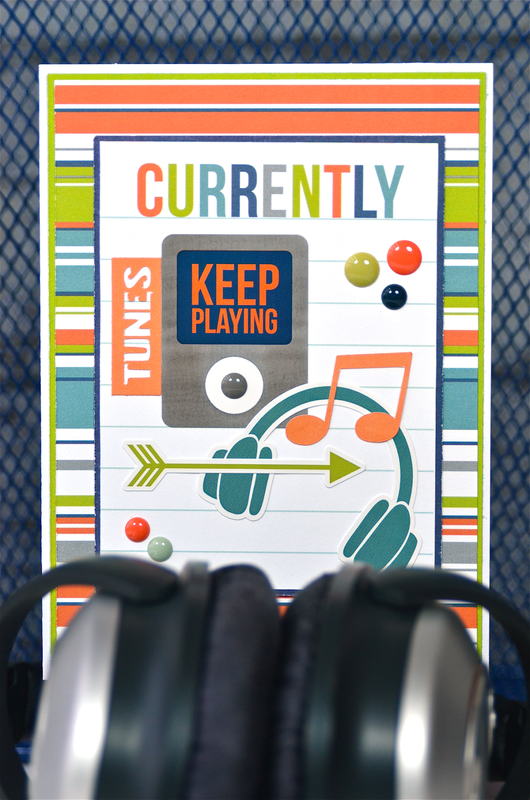 I created this card around the 3x4 "Currently" journaling card by layering a variety of stickers and Silhouette cut files to create a music-themed scene. There's one more part of this assignment I'd like to share. I was tasked with creating this set of cards to give as a gift, so I also came up with packaging which included a cello bag, a patterned paper band, some stickers and enamel stars. I'll leave you with a look at all three cards together. 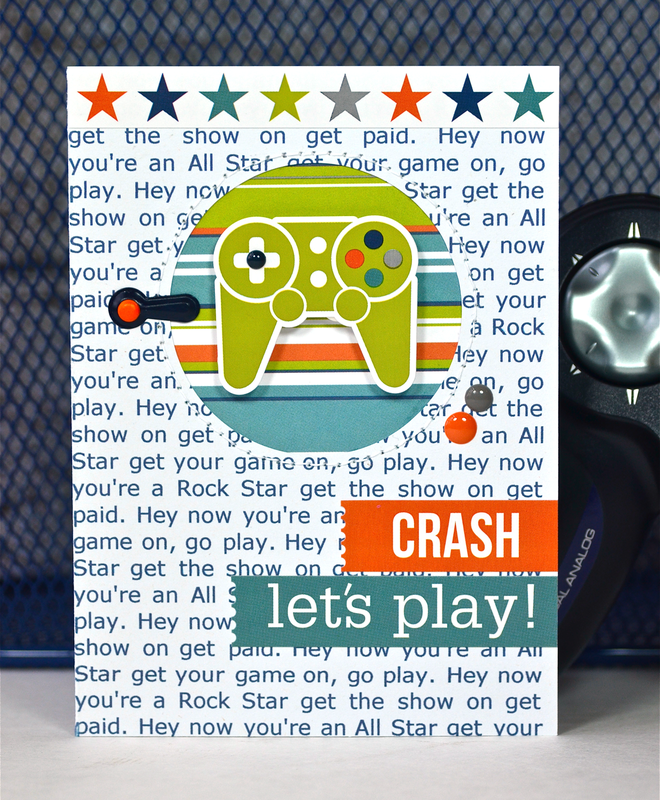 Yesterday I shared a birthday invitation created with Echo Park's Game On Mini Theme. Today I'm back to show you another card, this time focusing on the gaming side of the collection. I ran the card through my printer so I could print the lyrics to Smash Mouth's All Star lyrics on the front. After that, I used a circle cutter to create an opening toward the top of the card. I backed the opening with patterned paper and stitched it in place. After that, I simply embellished the rest of the card with stickers from the collection, using foam adhesive to "pop" the controller off of the card a bit. Thank you for stopping by today! I'll be back tomorrow with one last card from this collection, this time one you could give to a music lover. When I first got my Echo Park assignment to use the new Game On Mini Theme, Smash Mouth's All Star lyrics immediately popped into my head: "Hey now, you're an All Star, get your game on, go play..." Fits perfectly with a collection that covers both music and gaming, don't you think? After this initial, inspiring moment, I panicked a bit. As the mother of a teen girl, I don't have much experience creating with masculine collections. But, of course, I dove right in and stretched my creativity a bit. This is the first of three cards I made. I'll be sharing the others this week. The "what", "when" and "where" stickers made me think of an invitation for a birthday party so that's the route I took with this one. I used mainly stickers, popping some of them with dimensional adhesive. The "Game On" accent actually came from the product strip at the bottom of one of the papers. I'll be back tomorrow with a card featuring a gaming controller sticker. See you then! 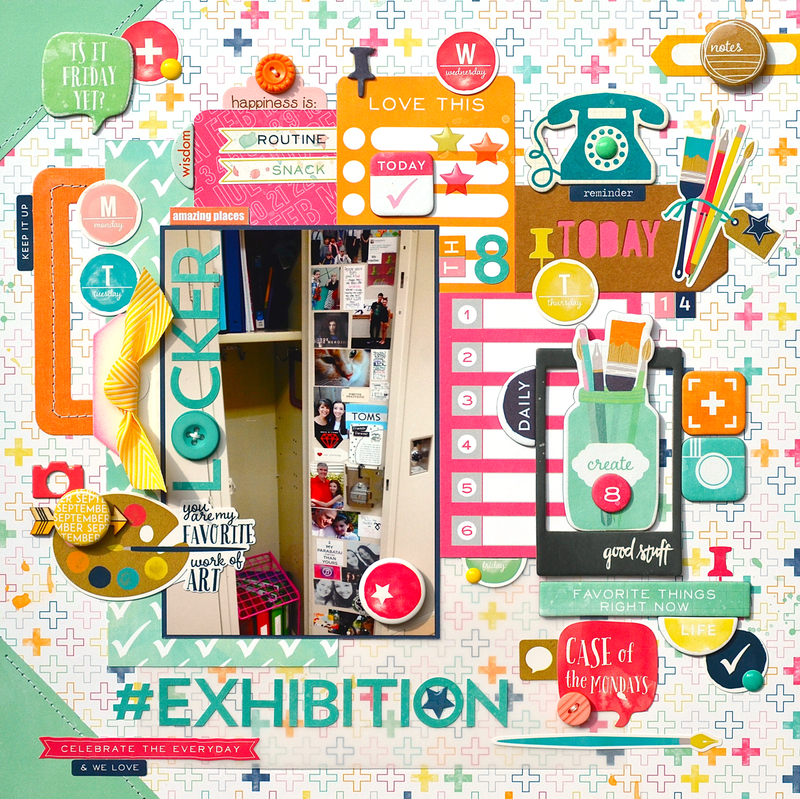 School starts tomorrow so I thought it fitting to share a back-to-school layout for the new Tell Me Dies, Tell Me Sweet Little Dies linky party at Paper Issues, sponsored by Jillibean Soup. 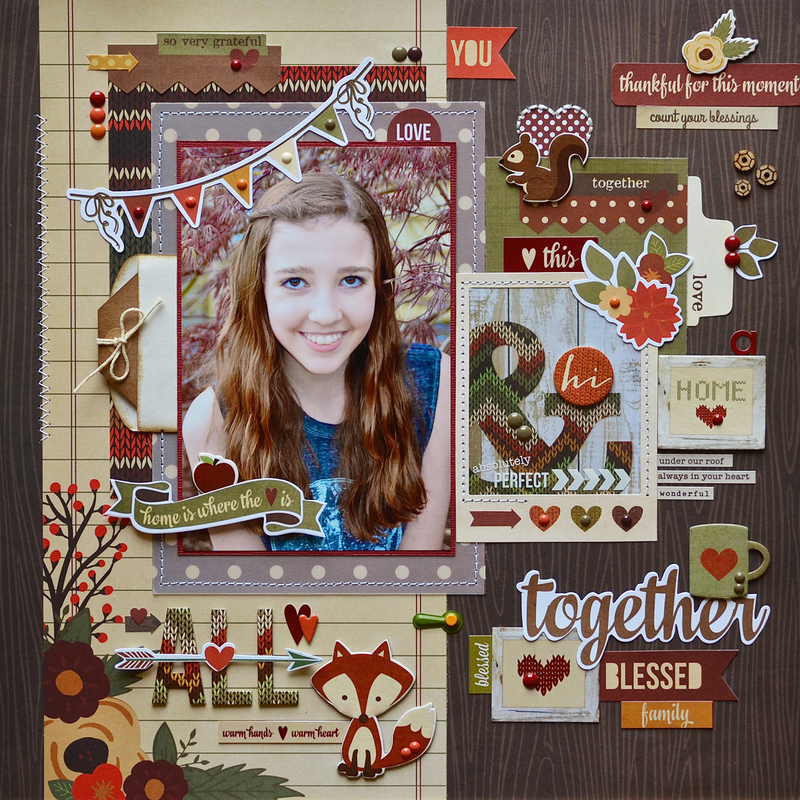 This page was made with Jillibean's Neopolitan Bean Bisque collection, back in 2012. I guess it was one of my favorite Jillibean collections because I used every last bit of it. It's hard to believe this photo was taken back when Alexa was a nervous, sixth grade newbie. Now, as an 8th grader, she was chosen to be a WEB (Where Everybody Belongs) leader. She mentors and helps the incoming sixth graders with all of the issues they have in the first weeks of school, like finding their classrooms, getting their lockers open, etc. 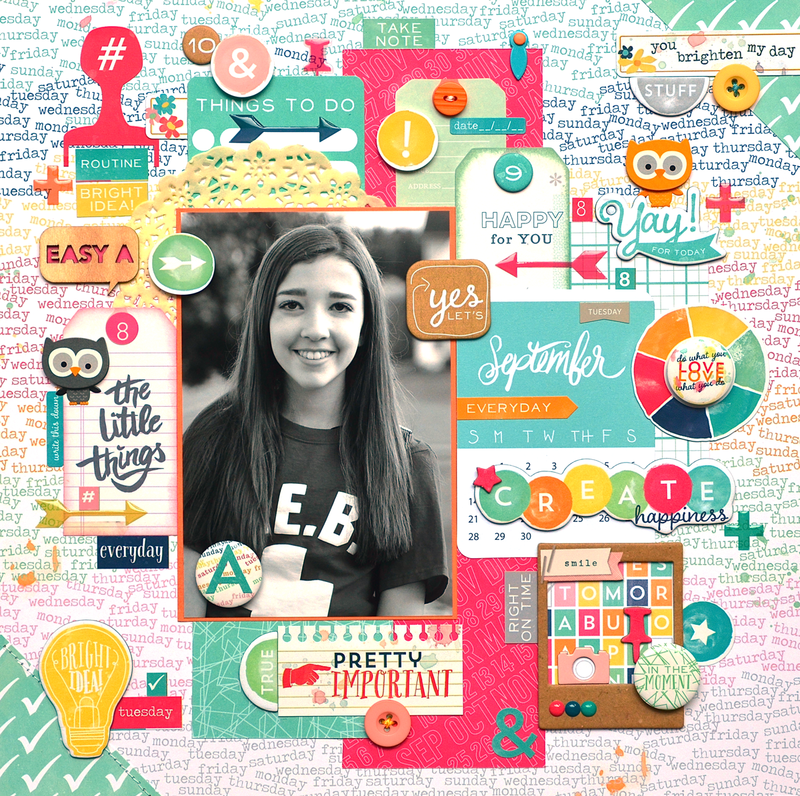 Using die cuts of all kinds, pre-made, manual, electronic, etc. You'll find more ideas on the Paper Issues blog so be sure to check it out for a chance to win a goodie bag of Jillibean Soup products.